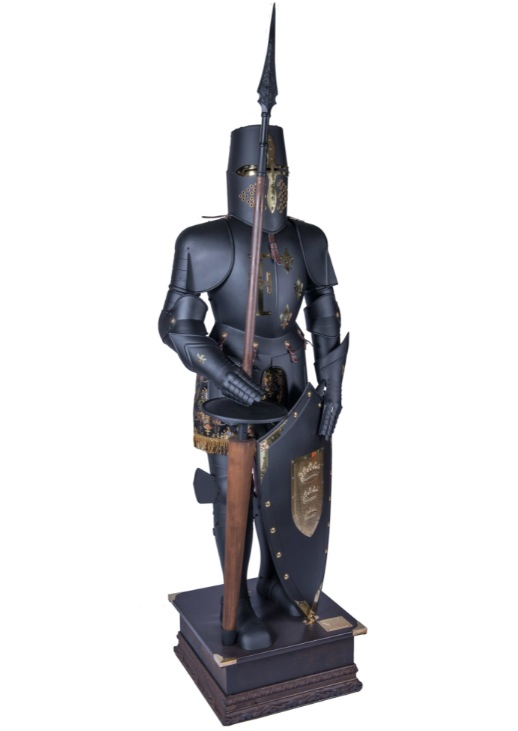 Medieval Armour - Tournament Armor (Decorative)- Medieval armour provided with an arabesqued fabric gown, two ostrich plumes inserted in the apposite holder of the helmet (not shown, available in different colours)and a wooden platform reinforced with metallic angles. 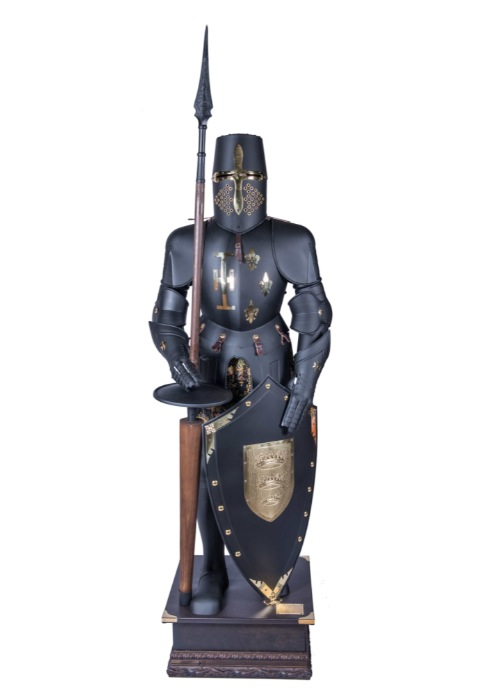 Though the origin of the armour of combat goes back to the Egyptian period, developing with Greeks and Romans, the medieval armour most known, formed of plates of steel or iron, linked to each other with hooks, nuts, and nails it holds the warrior by means of straps and clasps, it started being used in Europe, infantry as equestrian, in the 14th century and reached the perfection at the end of the 15th transforming in the middle of the 16th century in a luxury vestment for the warrior, adorned and embellished with the beauties of the sculptural art and of the metallic industries. It declined notably in the 17th century as the firearms were perfected and from the 18th century they are only used as incomparable ornament of castles, palaces, museums, and all that place that wants to incorporate into its stays a nice historical recollection. In the Royal Armoury in Madrid is kept one of the biggest and richest collections of armours in the world, and contains pieces principally of the 16th century age of Carlos I, wherefrom Marto takes his inspiration reproducing them in different sizes or scales, the materials used are very similar to the original ones, iron and steel moulded in a craft way, brocades imitating fabrics of the age, and bases of wood, giving ended to the metal " ancient patina " that protects its from the exterior oxidation. * Templar helmet with gold pate cross in the middle. * Shield with three golden crows in the middle. * Spear with wooden handle and engraved tip. 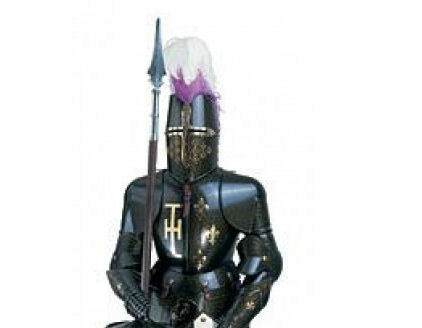 High Quality Armor of the Exclusive "Collection of Historic Armors" made by MARTO. Certificate of Quality and Origin. Made in Toledo (Spain). Helmet Spanish horse, characterized by large-billed visor which covers the entire face, exposing only the slots..